Of all the flowers that tell us spring has finally arrived, the bluebell is the one, particularly in the woodland around Outwood. Whenever one enters a wood or copse at this time of year the leaf litter floor is covered with the lavender blue haze of bluebells and their sweet scent of honey touched with vanilla hangs heavily on the air - it is just so magical. The bluebell, which is to be found across the western edges of Europe, has the Latin name Hyacinthoides non-scripta which is a reference to Greek mythology. The young prince Hyacintha was dying and the god Apollo shed tears which caused markings, looking like Al meaning "alas", on the flowers of the mythical Hyacinth and in order to avoid confusion with the bluebell the Greeks used the term non-scriptum, meaning no letters. The bluebell is particularly at home in the oak woodland that typifies much of the landscape of England, so much so that it is often referred to as the English bluebell and it is estimated that Britain has almost half the world population. Geoffrey Grigson, in The Englishman's Flora refers to the fact that in 1548 William Turner first recorded it in his book The Names of Herbes saying "some use the roots for glue". This use of the plant was obviously well established because archaeologists have found evidence that bluebell glue was used to affix feathers to arrows during the Bronze Age. The wide distribution of the flower has given rise to a large number of regional nicknames; William Turner said they were known as crowtoes; they were called Cuckoo's boots in Dorset, Single gussies in Somerset and Ring o' bells in Lancashire. The English bluebell can be distinguished from the alien Spanish bluebell - which has become very invasive and because of its propensity to hybridise, a threat to our well loved native - due to the fact that the bells hang down on one side of the flower head rather than being arranged all round, it has white rather than blue anthers and unlike the non scented Spanish species it has a wonderful perfume. The best spots to see them locally in all their glory is Hornecourt Wood or in the copse to the south of Little Collins. 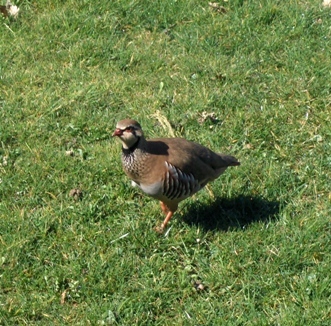 The first of two unusual sightings this month was made by Anne Morle when she looked up from her desk to see a pair of Red Legged Partridge (Alectoris rufa) aka the French Partridge to distinguish it from the Grey or English Partridge (Perdix perdix), that had settled on the grass just two metres away from her window (she managed to take a superb photograph of one of them). This species originates from southern Europe but was introduced as a game bird and now has become naturalised across flat lands in England. They have striking colouring; the plumage is sandy brown above, pinkish buff on the belly and a black band around the neck below a white throat with the beak, legs and rings around the eyes being a bright red. The second sighting was from Marion Warner who reported seeing a magpie carrying what she described as an absolutely enormous piece of tree branch which sounds as though it was intended as a major reinforcement for its nest.